Storing and accessing your documents online is very useful and common these days. 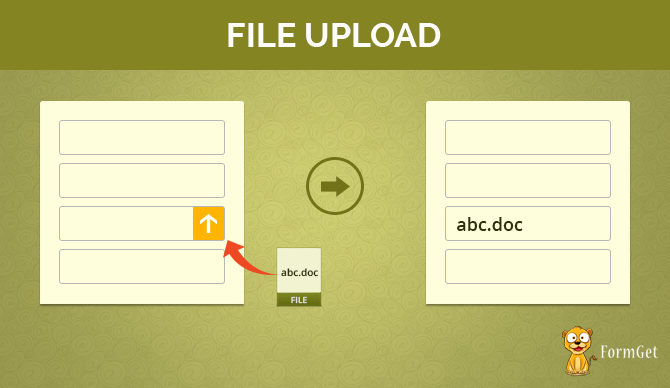 File Upload gives you the ability to insert file upload fields to your forms. FormGet supports uploading documents and files in several formats. It allows a user to upload images, docs, etc. through your forms. Add a file upload field in the form to use this extension. Allow uploading files to Dropbox (with Dropbox extension). The allowable upload size per file is 10 MB. Maximum allowable file upload size for a particular form submission is 50 MB. File Extensions allowed to upload (jpg, gif, png, tif, doc, zip, pdf, rar, docx, ppt, mp3, mp4, mov, flv). So if you need screenshots for delivering support via your customer support forum. If you want resumes for job vacancies in your firm. You can ask for any document that needs to be attached with the form using File Upload extension.